Local brunch addicts, please consider this list your new go-to. 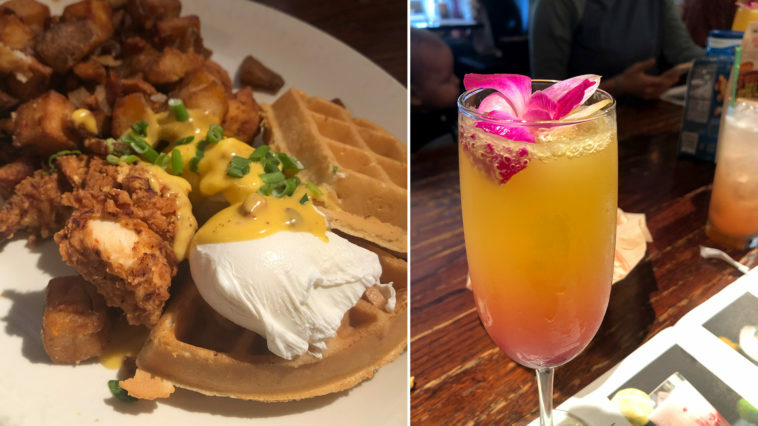 From Cap N’ Crunch crusted french toast to bottomless blueberry mimosas and funky waffles, here are the restaurants and dishes you need to have on your weekend bucket list. Celebrate #nationalfrenchtoastday with our oh-so-decadent Cinnamon Roll French Toast. Your taste buds will thank you for it! Another Broken Egg is a place of dreams. I mean, only if you dream about thick-sliced cinnamon-roll-battered French toast, topped with cream cheese icing, Foster sauce, mixed berries and whipped cream, but who doesn’t? Try their Cinnamon Roll French Toast and make your dreams come true. American Social offers a standard brunch menu as well as an egg bar. You get to be a the chef of the hour and create your own made-to-order omelets, with pecan cured bacon, house made sausage, home fries, seasonal fruits, and pastries and muffins for $19.50. Steelbach offers a sweet, southern breakfast of scrambled eggs, fried green tomatoes, bacon, and a buttermilk biscuit (Personally, I’m here for their biscuits with smoked honey butter). Or try their Hangover Burger—a burger topped with a fried egg, American cheese, shredded hashbrowns, bacon, and a special bloody mary ketchup. Marscarpone stuffed tiramisu French toast… YES PLEASE! There are a few options at this Italian haven that make our mouths water. We suggest trying the Tiramisu French Toast as our number one. Imagine a mascarpone-stuffed brioche bread topped with a coffee chocolate sauce. If dessert for brekkie isn’t your deal, try another favorite: the House Italian Benedict. This poached egg is complemented with pancetta and hollandaise, and paired with a house-made biscuit. Bizou is tucked away in the hotel Le Meridien. Drawing inspiration from form French Culture and cuisine, Bizou delivers on its brunch. We recommend the Sautéed Spinach and Mushroom Eggs Benedict. Boca is known for their organic and gluten-free ingredients from local farmers, ranchers, and fisherman throughout the region. If you’re looking for something bold, look no further than the Pork Belly Kimchi Hash. The plum glazed pork belly is paired with a sunny side up duck egg and potatoes, garnished with Korean kimchi and garlic aioli. Quaint, quick, friendly, and tasty, The Brunchery is one of Tampa’s best brunch stops. This classic style brunch runs from 8a.m. to 2p.m. Customers’ personal favorite item is the Bayshore Benedict — fresh croissant with scrambled eggs and cheddar cheese, topped with bacon, tomato slices, and hollandaise. Cask, located in the SoHo district of Tampa, brings you a brunch with a little southern flare. We recommend trying the Breakfast Tacos—flour or corn tortillas, sausage or bacon, scrambled eggs, cheddar blend, wild mushrooms, and hollandaise. Don’t forget. during brunch, Cask offers bottomless mimosas for $20 and $5 Bloody Marys. Daily Eats offers a food and drink menu full of delicious concoctions and pairings, ranging from a Cap’N Crunch hand-churned milkshake to a Blueberry Mimosa. This spot is our favorite among the Ciccios Group of restaurants for brunch. A staff favorite would be The Gigante, two eggs with applewood smoked bacon and whole wheat buttermilk pancakes! Step 1: Drool over this photo of our Waffles 'N Tweet. 🍽🍽🍽🍽🍽🍽 Step 2: Enter the giveaway we're hosting with @tampa_noms on their Insta. Why? 'Cuz we said so. Datz is one of Tampa’s most popular and irreverent spots. Their social media ingenuity is only matched by the creativity with which they craft each of their dishes. Every Saturday and Sunday, starting at 8:30a.m. you can experience their most savory menu items, including Bloody Mary’s with their special, homemade house mix and chicken fried waffles. When you visit we suggest you splurge. Datz’s funnel cake fries, served with caramel dipping sauce, strawberry pound cake, and Datz good hash — Sy Ginsberg’s corned beef, two eggs, crispy hash browns and challah toast — are all calling your name. Although Ella’s is open every night of the week, you can only celebrate their soulful brunch on Sunday. Starting at 11am, you can enjoy live entertainment, cocktails starting at $5, and the one-of-a-kind Funky Monkey waffle. With James Beard Best Chef South Semi-Finalist Chad Johnson as their Executive Chef, Élevage isn’t messing around when it comes to brunch. Their menu includes items such as Lobster & Soft Scrambled Eggs, Dill Roasted Salmon, and Burrata, Prosciutto, & Grilled Melon. Ocean Prime take pride in using simple, pure, local, and regional flavors on their made from scratch menu. The have a special Easter Brunch coming up featuring Blood Orange mimosas, and this delicious lobster, egg, and avocado toast. The Oxford Exchange is a social hub for Tampa residents. It’s also arguably one of the most photogenic gathering places in Tampa. When you finish exploring their bookstore and event space you can make your way to OE’s restaurant. Their brunch is a revelation. Sip on an OE Bloody Mary (Grey Goose mix with a Caprese Skewer) while you indulge in their pressed french toast covered in Nutella and fresh strawberries. Be sure to make a reservation! One of Tampa’s most go-to brunch spots is The Refinery. They’re open Sunday for brunch from 11a.m.-3p.m. Some menu items change weekly but you can still find some classics that remain the same. If you’re looking for a cute breakfast spot in a great location, look no further than Timpano in Hyde Park Village. We love a good breakfast flatbread, and Timpano delivers. Their flatbread is topped with sausage, peppadew peppers, green onions, scrambled eggs, and mozzarella. If you wanna try something a little sweeter, we recommend the blueberry pancakes with a cream cheese frosting and a wild blueberry reduction.